Dining Dish: 30th anniversary of the Maryland Wine Festival - get your vino on! 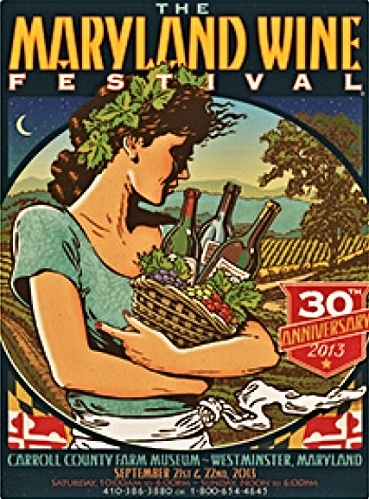 30th anniversary of the Maryland Wine Festival - get your vino on! It is pretty astonishing how far Maryland has come in wine production in the past 30 years; quality, number of emerging wineries and growing economic boom. For the vinophile this is the weekend to enjoy the fruits of these vineyards efforts at the Maryland Wine Festival. Choose from Saturday, September 21- 10 a.m. to 6 p.m or Sunday, September 22 – noon to 6 p.m. to attend. Forty vintners, music, food, and artisan crafts will fill your day. Bring your lawn chairs or blanket and enjoy. Chefs and farmers compete - you eat and drink! Sunday brunches at McDaniel College are back.